Acrylic Painting Classes start January 15 at the Berkeley Art Works, 116 North Queen Street in Martinsburg. Introduction to Acrylic painting; no prior experience needed. Introduce basic techniques, materials, etc. and how to use them. Classes are 2 hours in length with an emphasis on learning how to paint creatively with this medium. Instruction includes different techniques each week and an opportunity to practice or work on own project. Jean Kellogg is an award-winning professional fine artist, a craftsman and an art instructor for arts organizations, and for county and state continuing education programs. The expressive language of art, coupled with her love of lifelong learning leads Jean to create opportunities for artistic exploration, growth and creative play for others in varied media. A graduate of Marshall University, she resides with her family in the Northern Shenandoah Valley. Supplies: Basic student acrylic paint set (basic/primary colors plus white), Payne’s Gray, Acrylic Varnish Medium, inexpensive pack of varied watercolor brushes, pack of 6 gesso-prepared canvases or canvas boards, 8×10, 9 x 12, or 11 x 14, paper towels, Styrofoam plates, water container, plastic wrap. Tuition $80 for six weeks. Pre-register by January 10 to assure your space. For the intermediate painter. Building skills on a basic foundation, ready to move to painting composition, values and advanced brush techniques and textural paintings. Pre-register by January 11 to assure your space. The Berkeley Art Works will present a Cartooning and Comic Book Illustration workshop adults and teens taught by Kristina Hoffman. The workshop will be held at the Berkeley Art Works, 116 North Queen Street on Saturday, January 11 from 1-5pm. This workshop will feature the drawing and development of cartoon figures and story boards for graphic novels and comics. Experience an exciting approach to creating art using cartoon, anime, and comic book characters. Kristina is an experienced art teacher and professional artist, happy to share this unique art experience with the participants. Kristina is a Shepherd University graduate with a Bachelor of Fine Arts Degree in Drawing and Painting. Over the years she has developed her own creative style of illustrative art and storytelling inspired by the classic cartoons and comic books of her youth. She is happy to share her talent and experience with anyone willing to learn. Details and registration information is on the Web at http://artworks.berkeleyartswv.org/workshops/. Drawing and sketching classes start January 15 at the Berkeley Art Works, 116 North Queen Street in Martinsburg. Sketching with an eye towards gaining the correct perspective, figure study and portraiture. Sketch composition and values. Pre-register by January 10 to assure your space. Introduction to Drawing; no prior experience needed. Introduce techniques, materials, prop., form, etc. Supplies: Drawing Pencil Set: kneaded eraser, sharpener, charcoal pencils, ebony pencil, tracing & sketch paper. Tuition $60 for six weeks. Youth art classes start January 13 at the Berkeley Art Works, 116 North Queen Street in Martinsburg. The Egg Tempera painting class is for middle school students who want take their painting skills beyond their school art class. Working with a professional artist to learn advanced brush techniques, color blending and developing a painting style to achieve soft paintings with glowing colors. Creativity is encouraged. Supplies: Instructor will provide the eggs for the painting sessions. Students would be expected to bring watercolor painting paper, and watercolor brushes., pencils for sketching/tracing and a gum eraser. Paint will be provided. Hilda Eiber is a professional potter and artist. Her work is exhibited in the tri-state area. She is known for her imaginative pottery pieces and attention to details. She has been an active participant in the Arts in Education Program, bringing Professional artists into the Classrooms of Berkeley County. Tuition $55 for six weeks. Pre-register by January 8 to assure your space. The class is designed for the home schooled high school or middle school student. The students will be instructed in various art styles as well as art history. The students will have hands on experience creating artwork and critiquing each other’s work. Kristina is a Shepherd University graduate with a Bachelor of Fine Arts Degree in Drawing and Painting. She is an experienced art teacher and professional artist. She is happy to share her knowledge, talent and experience with anyone willing to learn. Would you like to step back in time and meet an artist like Matisse, Leonardo da Vinci or Paul Klee? This is your child’s chance! In this class children will study the biography of the artist and create a masterpiece that exemplifies the artist’s style or content. Make art history come alive for your child! Tuition $50 for six weeks. Pre-register by January 13 to assure your space. 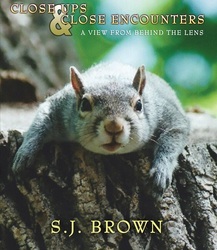 On December 13 from 6-8pm, author and wildlife photographer S.J. Brown will be at the Berkeley Art Works, 116 North Queen Street in Martinsburg for a presentation and book signing. All ages are welcome. The event is free and open to the public. Brown, whose photographs have been published in books, magazines, and other publications, has been photographing wildlife for more than 10 years. She is part of the Women in Science Program for 2013.